Forced Bed Aeration ™ (FBA ™) is a new wastewater treatment technology which enhances constructed wetland treatment performance. Significantly higher contaminant removal rates are attained along with an increased consistency of performance. Developed in the USA by our partners Naturally Wallace, FBA ™ can be used in both horizontal and vertical flow constructed wetland systems. Blowing air through the wetland system makes the system oxygen unlimiting Increasing the treatment capacity by up to 15 times. This new technology can treat wastewaters high in BOD, SS, NH4-N and any other organic contaminants. Forced Bed Aeration ™ reed beds can reach performance levels which have been unobtainable in standard reed bed systems with less performance variability. 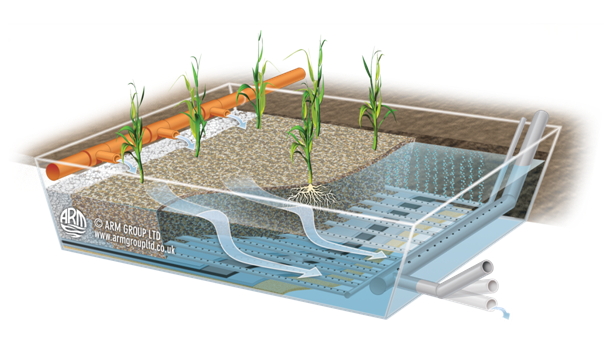 Aeration of horizontal and vertical flow reed beds has multiple advantages. Please click the download button below to download a case study based on the System for further information.